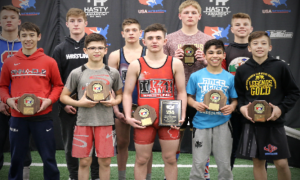 Both RaVaughn Perkins (NYAC, 66 kg) and Joe Rau (Minnesota Storm, 98 kg) enjoyed stunning rises to the top of their respective weights in the US but unfortunately, saw their Olympic qualifying bids fall short. It all took place earlier today at the 2nd OG Qualifier in Istanbul, Turkey. The 2nd OG Qualifier represented the last chance the US would have to seal its remaining three spots for the Rio Games. 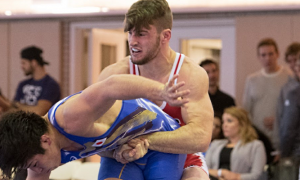 Jesse Thielke (NYAC, 59 kg) qualified his weight for the 2016 Olympics when he defeated Donior Islamov (MDA) in the semifinals before falling to six-time World Champion and 2012 Olympic gold medalist Hamid Soryan (IRI). Perkins won his first two bouts of the day in impressive fashion. First, he took on Pan Zheng (CHN) in the qualification round. A first period 2-0 lead for Zheng did little to rattle Perkins’s confidence. Heading into the second the American re-asserted himself, working in on Zheng repeatedly, which resulted in a par terre opportunity. Perkins, who has really improved on his gutwrench variations, started with a high lock while he reset he grip. He then proceeded to roll Zheng once, and then again. Perkins turned Zheng five times, going one way and then another. The end came with 1.18 left in the second period, sending Perkins on his way with an 11-2 tech fall victory. Next up was Greece’s Vladmiros Matias. A familiar theme began to unfold once again. Matias snagged a headlock for two points, but Perkins quickly escaped out to find top position, making the score 2-1. With 30 seconds left in the opening frame, Matias got around Perkins and bodylocked him down for another takedown. The score was 4-1 for Matias leading into the final stanza. With two minutes remaining in the match, Perkins got deep double underhooks and locked around Matias, driving him straight down into the mat and nearly came away with a fall. Regardless, it was good for four points and a 5-4 lead. Perkins would tack on another two when he shucked Matias away off the ties near the edge with just under 45 seconds left. The final score, 7-4 Perkins. The quarterfinal is where Perkins ran into trouble. Ruslan Tsarev (KGZ) looked to frustrate and slow down Perkin’s attack while looking for his own offense. The NYAC wrestler had the first offensive par terre chance, but could not seem to find the momentum to drive for a turn. The tables turned shortly thereafter, as Tsarev got his first par terre opportunity and used it to lift Perkins for three. It was a dynamic attempt. He then re-locked and tried again only the second time, Perkins ambled out. It was 3-0 Tsarev moving into the second. Perkins had his best shot in the final period. A third passivity on Tsarev resulted in a caution point, closing the gap to 3-1. In the ensuing par terre, Perkins went for his lock, only Tsarev failed to clear, holding Perkins by the wrist in effort to stifle the movement. This time, two more points would be knocked from Tsarev, tying the score at 3, though Perkins held criteria. However, as the two jostled along the zone, Tsarev received a fortuitous caution point, netting him the lead 4-3 and the win, ending Perkins’s qualifying bid. Tsarev advanced to the finals, pulling Perkins into the repechage. Perkins, no doubt hurting from the quarterfinal loss, didn’t seem to have the urgency he has expressed as of late. He was defeated by Armen Vardanyan (UKR) 8-0 to close out his day. Even still, it had been a heck of a run for the Nebraska native. 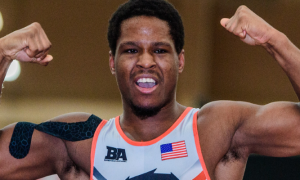 Perkins rounded back into form following the US Olympic Trials and came very close to qualifying 66 kg at the 1st OG Qualifier two weeks ago, earning a bronze medal in the effort. And he looked impressive today in Turkey, downing two seasoned, game opponents before dropping the decision to Tsarev. It might not be the result either he or the US was hoping for, but there is no doubt Perkins’s future looks exceptionally bright. Fan favorite Joe Rau got off to a sizzling start in his own right. 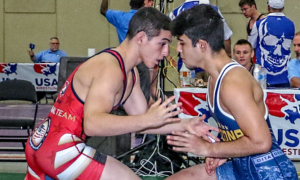 Taking on Narek Setaghyan (Rehanyan) from Spain, Rau employed a probing yet aggressive tone, constantly working to find mismatches inside for him to score off of. Two minutes into the first period is when Rau stuck first, nailing a turn for a quick two points. He was on his way. In the second, Rau consistently jockeyed for position, shucking and pulling on Setaghyan in order to open things up. He would find a bodylock, which he twisted for a takedown. A turn following the action gave him an additional two. Up 6-0, the “Rau Plow” was in full effect. As time was winding down, Setaghyan moved in, desperate to get back into the match. Rau easily shuffled the attempt to the side, coming around for another two points and the win, 9-0 (ESP challenged and lost, giving the US another point). 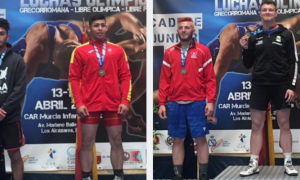 Rau’s next opponent was Honduran Kevin Mejia Castillo, a wrestler Rau defeated nearly two months ago at the Pan Am Qualifier in Frisco, Texas. Unfortunately for Rau and the US, this match would not be a repeat of what happened back in March. Castillo got in on Rau, sagging and pulling to lock around the American’s body. Rau fought diligently, maybe too much so. 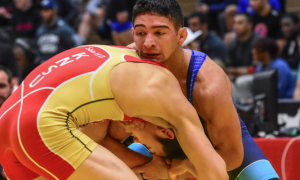 The leverage was on Castillo’s side and when the two collided to the mat, Castillo was able to hold onto a trapped-arm gutwrench, which he took full advantage of, rolling Rau around repeatedly for a shocking 8-0 win, thus eliminating Rau from qualification contention. It might seem disappointing and it is. Rau certainly had the makings of a wrestler poised to fight his way through this bracket. But that doesn’t take anything away from the kind of year he has had. 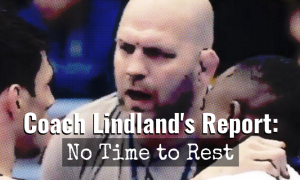 Rau has found a comfortable new home at 98 kg, wrestling with vigor, confidence, and energy. 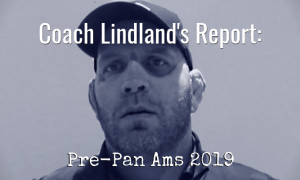 He served notice to the masses when he defeated Caylor Williams (Army/WCAP) back at the Bill Farrell Invitational and took out every other serious challenger in his path ever since. This is an athlete who has discovered a new life as a professional, and is also someone Greco fans across the country should be proud of. Because like Perkins, Rau’s trajectory is still growing and deserves to be acknowledged.